Easy to care for - just hose clean & line or air dry. Loved the first one so much I had to order another. Now I have a gray one at the front door,and a aquamarine at the back door. Love it. Love the color selection, the style and quality. I bought one for me and one for my parents. I ordered two of these and they are perfect, We absolutely love them. Easy to clean. This mat is great. We love the blue color. The texture on bare feet is nice. We would buy more when we need them! I LOVE this mat! It is not only very stylish and adorable, but it is very functional. I keep it in the foyer at my front door. There are no issues with the front door passing over it. It collects lots of dirt, grass, debris, etc. yet vacuums up like a charm. I bought the teal and couldn't be happier! I love this mat. Matches door color. Fits just right! The design is really great. THANK YOU! for coming out with this item! We bought two of these for the doors we use most often. They are very sturdy, the mat stays put, and they are both as cute as can be. We have one brown and one blue mat and love them both. 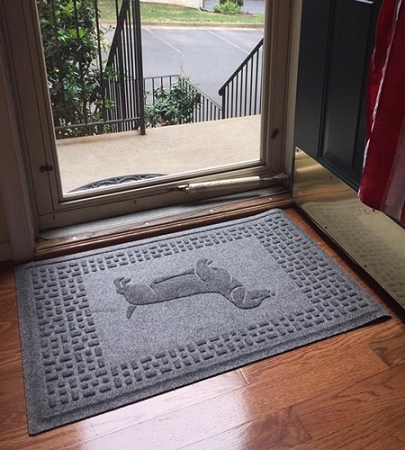 Sharp looking mat by our sliding glass door--the main door used to let our 2 doxies in and out. Protective for the hardwood floor and very absorbent-vacuums easily and thoroughly. Couldn't be happier! I Love, Love, Love this mat. It is so cute! I like it enough that I have now ordered another one for my other door. 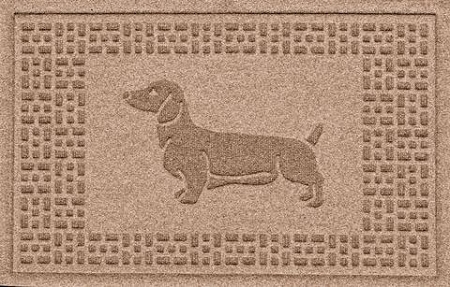 We ordered our first Aqua Shield Dachshund Doormat in Bluestone to go on our back porch which had just been set up as a special room of tribute to our dear dachshund Kody who finally succumbed to a series of long term illnesses in June. The mat made the room even more gorgeous...the quality is superior and the color was perfect. We were so impressed that we bought a second one to go on the front porch of our Federal style home. That mat is in different light and if anything it is even more beautiful than the first. Great job, Dachshund Delights! Love them! I now have two I liked them so much. The color is vibrant, material is heavy duty, well made. It works well - even traps mud off of little paws. And it makes me smile when I open the front door . Love this mat. I've had LLBean Waterhog mats and this one is every bit as high quality! Love our new door mat! Love our new door mat! We use it at our back door and it is perfect. Does a good job of removing dirt and we never tire of looking at dachshunds! We got this mat in dark brown so that it wouldn't show dirt. It is very sturdy and a nice brown color. And it looks so cute on our doorstep. 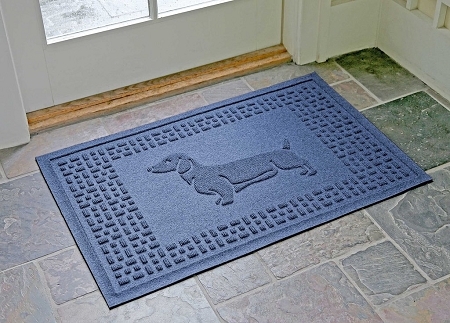 Love these sturdy doxie rugs!!! I have bought 4 of these rugs. First of all, the doxie design is precious. More importantly however is the way the rug sheds water that collects when my pet spills water from her water bowl. We have another rug next to the door to our deck--it has worked well for us for over 4 years. Two other rugs stand by our front door & by the door from the house into our garage. They wash nicely with some soap and a hose outside. We recommend this quality doxie rug 100%. Great doormat. Really holds up in all types of weather. I bought 3. 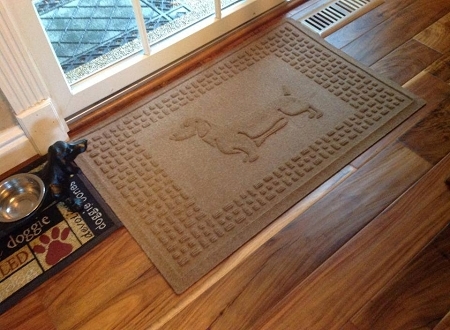 Love the dachshund mat. Haven’t had it long but it appears to be sturdy. We’ve put it at our front door & it looks nice. Love love the dachshund! I've had the rug for about 2 months now, and it works very well to trap dirt at the door. Haven't had need to wash it yet, but it rained rather heavily last month and still looks brand new. I find it very attractive at the front door and I like it a lot. This is a very well made item. I have ordered a few in different colors and love them all. I love these mats and bought two. To clean them, we take them to the car wash and attached to the wall with the floor mat clamps. They come out looking new. They are very good quality.